[dropcap]S[/dropcap]amsung had a considerable presence at Pax East 2017. 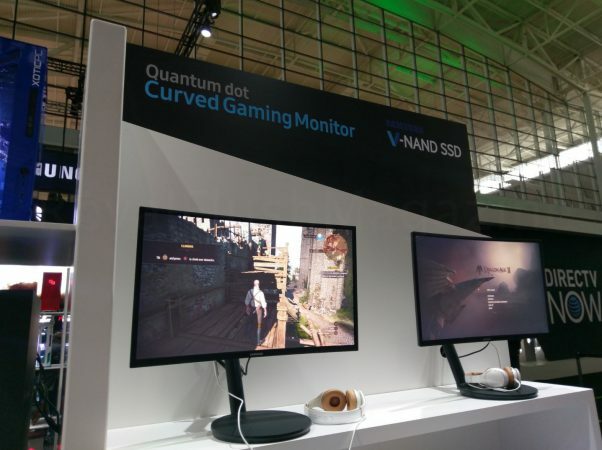 Today, let’s take a peek at their upcoming Quantum Dot Curved Gaming Monitor. First introduced at Gamescom 2016 and IFA 2016 Conferences, the CFG70 curved monitor is designed specifically for professional gamers. It includes an enhanced picture quality as well as player-friendly features while providing an immersive gaming experience. The CFG70 is the first curved gaming monitor to feature Samsung’s quantum dot technology which delivers brilliant colors across a 125 percent sRGB spectrum. This added luminance produces a 3,000:1 contrast ratio and amplifies previously-hidden gaming details in both light and dark settings. It also employs an environmentally-safe, cadmium-free design. Intrigued? Why not continue reading through a few of the highlights below. If you’re interested in learning more, please visit the CFG70 Curved Gaming Monitor Product Page on Samsung’s website.